‘Long ago, in a time forgotten, a preternatural event threw the seasons out of balance. In a land where summers can last decades and winters a lifetime, trouble is brewing. The cold is returning, and in the frozen wastes to the north of Winterfell, sinister and supernatural forces are massing beyond the kingdom’s protective Wall. At the center of the conflict lie the Starks of Winterfell, a family as harsh and unyielding as the land they were born to. Sweeping from a land of brutal cold to a distant summertime kingdom of epicurean plenty, here is a tale of lords and ladies, soldiers and sorcerers, assassins and bastards, who come together in a time of grim omens. First of all, this book is big – its nearly a thousand pages long. I liked that – the bigger the better. Each chapter in A Game of Thrones is told from the point of view of a different character, this was hard to get used to at first – I would just settle down into Arya’s story and then it would change to Neds. but I actually think this style works really well, especially when the characters storylines begin to intermesh. The majority of the viewpoints are from the Stark family. The Starks are a aristocratic family that live way up in the North, at Winterfell away from the politics and mystery of the Kingdom. Eddard (Ned) is a proud, moral man who loves his family and is very relunctant to leave Winterfell when the King asks him to become his Hand (chief advisor). His wife, Caitlin is convinced that the Queen may have something to do with the death of her brother in law and the attempted murder of her son. Sansa, Ned and Caitlins daughter, is beautiful and ladylike and betrothed to Prince Joffrey; Arya, a wild tomboy who prefers fighting to dresses and Bran, who is in a coma after an attempt on his life. Also narrating is Jon Snow, Ned’s illegitimate son, Danearys, a princess who is married to Khal Drogo and Tyrion Lannister, brother to the Queen. My favourite character was Tyrion Lannister. He is a dwarf, and frequently mocked by other characters but because of his physical ailment he is witty and often uses his intelligence to escape dangerous situations. I also like Ayra, the wild tomboy of the Starks. The various twists and turns in this book were often unexpected and always made me want to read on. I think the criticism about the portrayal of woman in the novel is slightly justified – I say slightly because Daneary’s is only thirteen when she marries and is impregnanted pretty soon after marriage. I felt that this particular section of her life wasn’t a positive portrayal as a woman, but as the book progresses she really grows up and matures given the situation. Martin also writes both Caitlin and Arya in particular as strong woman. 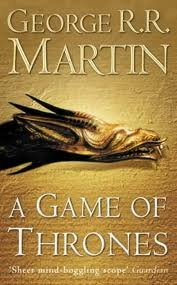 Overall I really enjoyed A Game of Thrones and I will be reading all the others very soon. Although a long book, it seemed fast paced and I really enjoyed and connected with some, if not all of the main characters. The plot will really keep you on your toes and Martin is not afraid to endanger and even kill some pretty important people. However if you’re adverse to violence, bloodshed and scenes of a sexual nature I would’nt read this. However if you are a fan of fantasy and on the lookout for the next epic series, I would check A Games of Thrones out. Also I’ve heard the TV series based on the books is fantastic – I don’t know whether its being shown in England yet though. I liked the first 4 books of the series. The fifth book was a major dissapointment to me, particulaly the last 25% of the book. Totally felt cheesy and the pacing was absurdly slow. The first four books however are AMAZING…definitely continue the series. The TV show is FABULOUS!!! !